Now that football season is here and in full swing I no longer have a husband on Saturdays. It becomes his day to kick back and soak in all the college football possible. He loves it. And I have to admit that I enjoy the occasional game too. Ok...so what I really enjoy is inviting friends over and throwing a tailgate party. 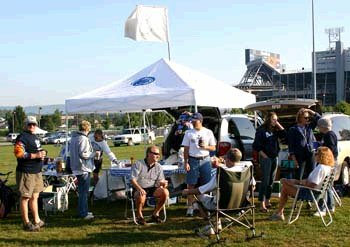 You don't have to be parked outside the stadium to tailgate. After all according to the American Tailgaters Association 30% of tailgaters never see the inside of the stadium. So do it in the comfort of your own home, or if it is possible head over to the stadium for the real experience. Think through your winning menu the day before. Plan your strategy and pack exactly what you'll need for your ultimate tailgating experience. How many friends are stopping by? What's game-day weather going to be like? Don't forget foods that match your team's color! In a large skillet, brown ground beef. Set aside to drain and cool to room temperature. Spread the beans into the bottom of a 9x13 inch serving tray that is about 1 1/2 inches deep. Sprinkle 2 cups of shredded cheese on top of beans. Sprinkle beef on top of cheese. Spread sour cream very slowly on top of beef. Spread guacamole on top of sour cream. Pour salsa over guacamole and spread evenly. Sprinkle remaining shredded cheese. Sprinkle black olives, tomatoes, and green onions on top. Preheat an outdoor grill for high heat. Mix together the ground beef, garlic, olive oil, salt, pepper, and basil. Divide into four balls, and flatten into patties. Fry the patties for about 3 to 5 minutes on each side, or to desired doneness. The internal temperature should be at least 160 degrees F (70 degrees C). Remove from grill and place onto hamburger buns. Top with desired toppings and condiments.